It’s a bright Monday morning at English Village, the second day of my weekend. There is a pleasing blanket of snow on the ground and sunny blue skies with a cool crisp air. I have to confess, at nearly mid-day… I am still in my pajamas. 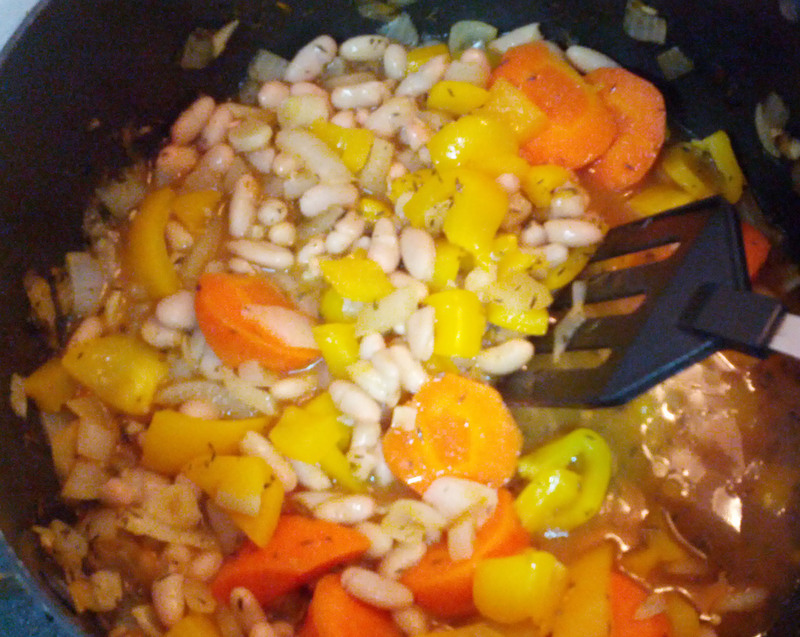 The Making of White Bean Vegetable Extravaganza! It is a typical day in many ways. I began the morning with chanting, the foundation of my SGI Buddhist practice. The morning has easily drifted into noon and I am enjoying some homemade soup for lunch. It is delicious and just what the doctor ordered. It was inspired by a recent Pinterest pin, Tuscan Vegetable Soup. 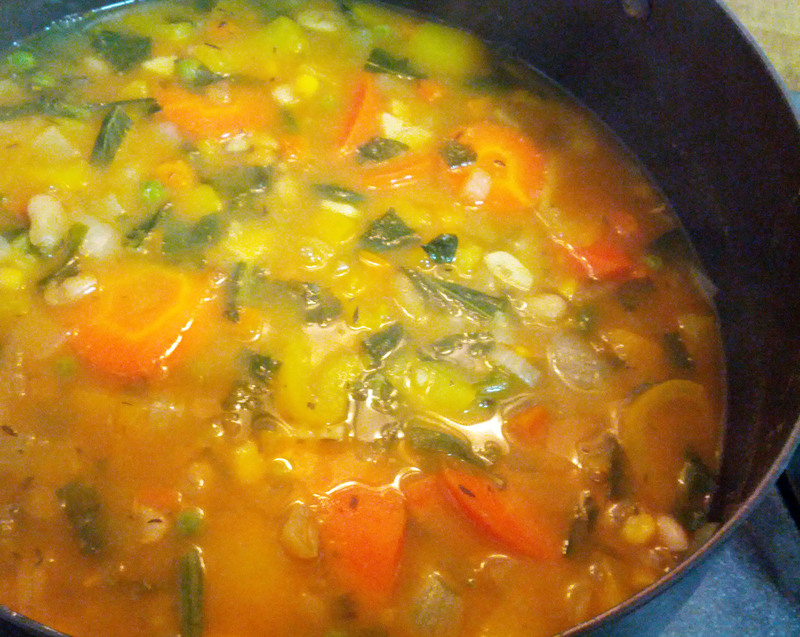 But as I have been grocery-challenged lately, it really should be called “whatever I had left in the refrigerator” soup… or as I continued to add random this and that, “White Bean and Vegetable Extravaganza!”… you know how it goes. Yesterday was a great day for me. I began the day early as I needed to make my way to Seoul for an 11am SGI World Peace Meeting. This is a regular monthly meeting of my English-speaking chapter in Korea of the international buddhist organization. At each meeting a member shares their experience of how chanting and SGI has benefitted their life and this month I was invited to share. It was a great exercise to revisit my journey in SGI over the past three years paralleled with my gypsy adventure and just take note of how amazing it has all been. Writing the story of the fulfillment of so many large and small unexpected gifts almost felt like telling a story seen in a movie or read in a book. I had to remind myself, no really, it all happened. And it happened to me! The basic understanding of SGI Buddhism is that we are operating within a world of cause and effect. That is a cause (word, action, thought) creates the effects in our lives. This is Karma. And so truly, we are not victims in our lives but instead living out the effects of our past causes. With this in mind, SGI Buddhism offers the opportunity for liberation from past causes through chanting “”Nam-myoho-renge-kyo,” which, as identified by the 13th-century Japanese priest Nichiren, is the key to developing the Buddha nature. As it says on the SGI website, “chanting Nam-myoho-renge-kyo enables people to unleash their hidden potential and unlock the courage and compassion to transform their lives and create positive value in their family, community and society.” I think of chanting like putting the most powerful pristine cause into creating a new effect in my life. Or, in other words, changing my Karma. I have only been practicing for three years now, but I have to acknowledge the very specific things I have chanted for on my journey that have found their way into my life in distinct and unpredictable ways. I see my chanting practice as a tool for opening the door of the impossible and letting the possible in. Sharing my experience to the group was really great for me. It felt good to say out loud what I had accomplished and to take note of the many ways that chanting and SGI have been a pivotal part of my journey. Additionally, it is said in the practice that any time you participate in an SGI activity or share your experience, it is another way of creating a powerful cause in your life (which brings a positive effect). And I noticed that after sharing my experience to the group I felt transformed. I spent the rest of the day feeling like I was in a sweet little slot of life. 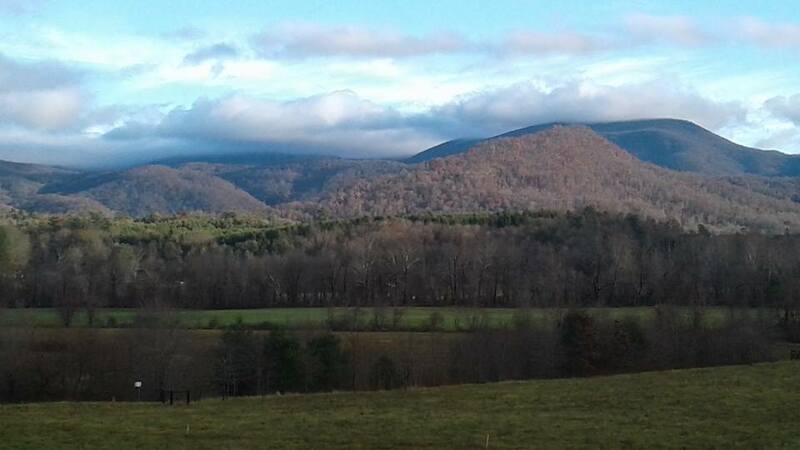 It was as if my being just bypassed all the negative trappings of daily living and stayed for a bit in a crisp cool place. And so, I continue the simplicity of my day. As I find the considerations about “what’s next for me?” beginning to dance in my head, I will leave you with the message channeling through my mac speakers courtesy of Pandora.com… “Don’t worry about a thing. Cause every little thing is gonna be alright!” Have a great day! And don’t forget to write, it’s always good to hear from you! Image above, the snowy greeting outside my front door on a wintery Sunday morning. So nice to hear things are going well for you. Thanks for the wisdom. Hello! I just moved to Korea and luckily I managed to stumble upon your blog! How can I connect to the local SGI here in Seoul?